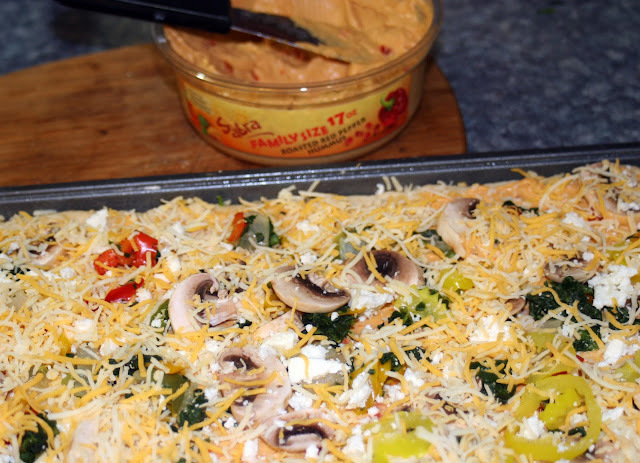 After a bit of recipe surfing, our game day menu consisted of Sabra Hummus Veggie Pizza, Baked Corn Chips with Sabra Pico de Gallo Salsa. The Sabra inspired recipes were very well received. Shocked and overwhelmed by the response, (they should never argue with me about food) I created a few more quick and easy finger foods with the hummus and salsa the following day. Preheat oven to 400 degrees F (245 degrees C). Gather all ingredients. When using frozen spinach, thaw and drain complete, pressing out all water. Roll out dough on a lightly floured surface. Spray a large pizza pan or jelly roll pan with nonstick cooking spray. Place dough on pan, push dough to edges, filling the pan. With your fingertips, make dimples in the dough. Allow the dough to rest while you wash and cut all vegetables to preferred size. 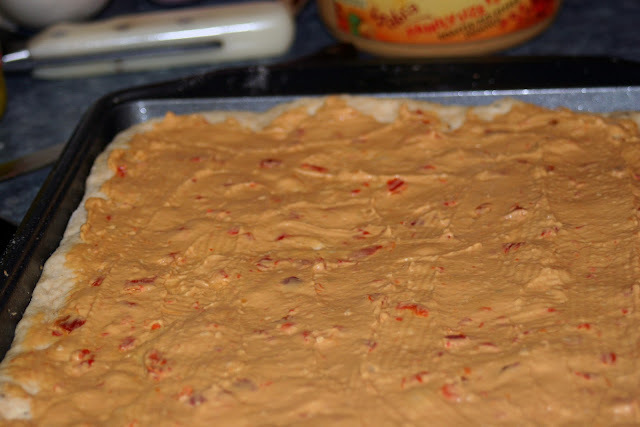 Liberally spread hummus over the dough, leaving about a half an inch of dough exposed around the edges. Be sure the hummus has filled the dimples in the dough. 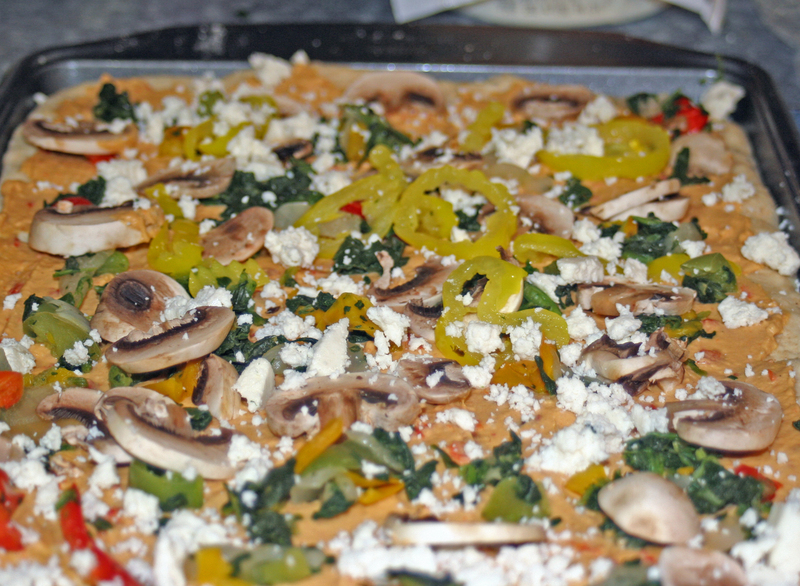 Add your choice of pizza toppings, crumbled cheese, and finally a light covering of shredded cheese. Those carnivores who originally cringed at the mention of hummus, ate more pizza than the hummus lover did, imagine that! The hummus made for a very creamy, savory sauce. There was noting odd about the flavor, something I wondered about in advance. Two factors made this an awesome pizza in my opinion. One, the combination of hummus and fresh veggies melded perfectly. Secondly, the roasted pepper flavor was evident throughout, offering a rustic sort of flavor. Combine water, olive oil, sugar, salt in pan of bread machine Add flour, and then sprinkle garlic on flour. Lastly add yeast. Turn machine on dough cycle. As the dough begins to form, sprinkle in the oregano. Close the lid and allow dough cycle to complete. My dough cycle is 1.5 hours total time. 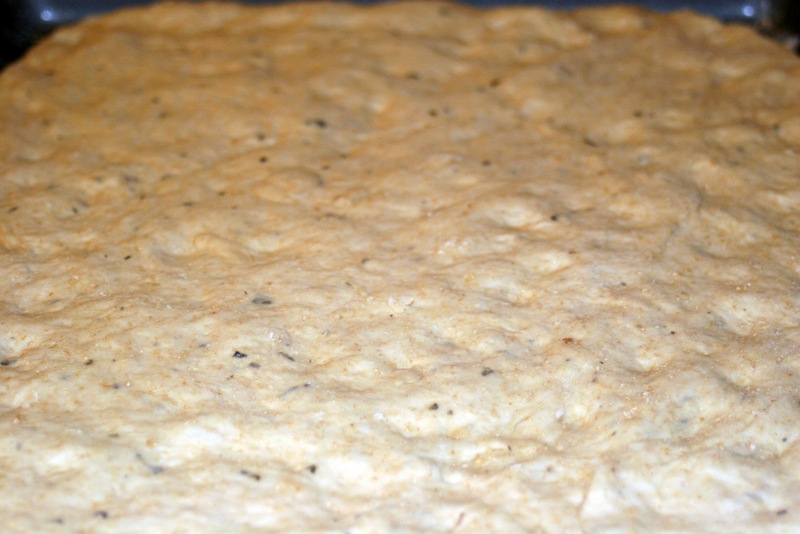 Originating from Allrecipes, it did take quite a bit of adjusting however; this bread machine pizza dough recipe is now my favorite for pan pizza and perhaps even foccacia bread. The crust is light and airy, perfect for a foccacia yet strong enough to hold a load of toppings and cheese. In addition, one could easily change up the seasoning in the dough to fit a particular foodie theme. Sabra makes a whole host of dips, salsa, and hummus. They are perfect for kicking up the flavor of quick and easy recipes. 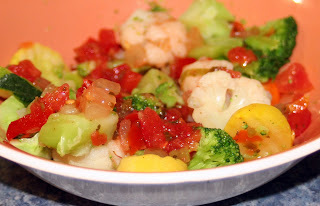 Added a few spoonfuls of Sabra Salsa to mixed vegetables, then heat and serve for an easy, spicy side dish. We liked the Pico De Gallo, medium heat, the best. 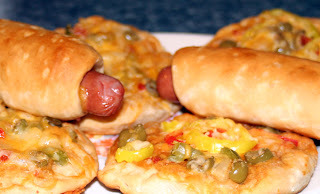 Fond of hot dogs in a blanket? Spread biscuit or crescent rolls with garlic hummus, sprinkle with cheese, and then roll as usual. 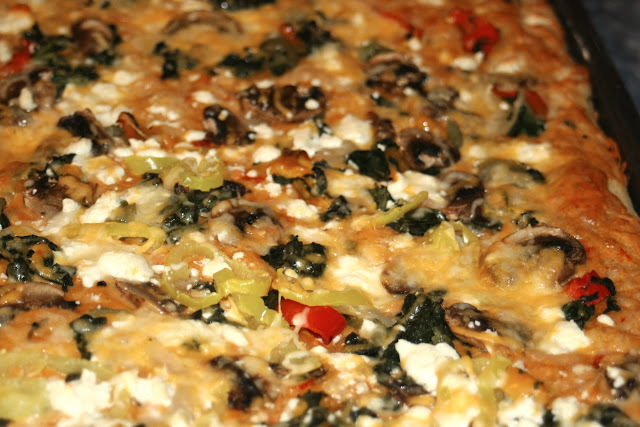 Bake for 15-18 minutes and… yum! Mini pizzas are a quick and easy snack. Press out refrigerator biscuits making thin dough rounds. Spread with flavored hummus; add toppings, sprinkle with cheese, and bake for about 10 minutes. Thanks to Sabra and the Foodbuzz Tastemaker program for providing product and coupons.